WHEN: The City Sports Grille at Spare Time Northampton, 525 Pleasant St., Northampton. 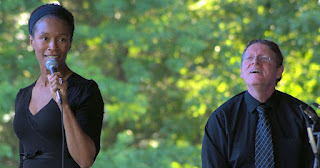 We are looking forward to featuring the dynamic duo of Jeff and Dawning Holmes on trumpet and vocals respectively. Jeff is also and an accomplished pianist, drummer, composer, arranger and is the head of the Jazz Studies Department Mass. Benjamin Sears earned a BFA from RISD in illustration (1996) and an MFA in painting from Cranbrook Academy of Art (1999). 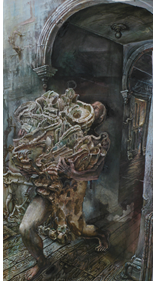 He is a working artist and has exhibited throughout New England and New York state. He has been teaching since 1999 and currently teaches art at Amherst Regional High School. 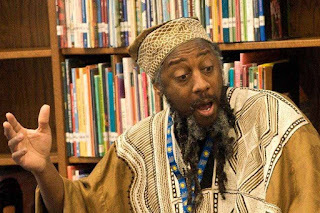 Lennie Kaumzha is a native of Illinois whose career has included teaching math in the Gambia, West Africa as a Peace Corps volunteer, and organizing poetry, music and art events as a worker-owner of the Common Ground restaurant in Brattleboro, Vermont. He studied art at San Jose State University in the 1970s and has lived in New England since 1978. He is currently a self-employed craftsman, fashioning electric and candle lanterns from recycled tin cans. WHEN: Feb. 9, Mar. 9, Apr. 13, and May 11 from 7-8 pm. 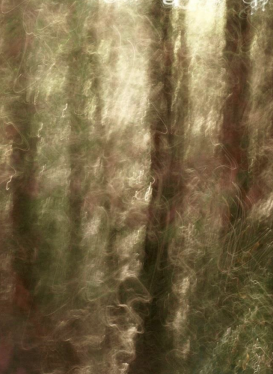 On four Northampton Arts Nights Out this spring, photographer Pamela Petro and poet Naila Moreira will present an art exhibit, Dusk at Macleish, of seven ecological graphic poems on the campus of Smith College. A word and image digital presentation projected on a triptych of screens, the exhibition will take place within a pop-up parklet on the green by the Smith College Art Museum on Feb. 9, Mar. 9, Apr. 13, and May 11 from 7-8 pm. The photos and poems of Dusk at Macleish reflect on the fragile moment in ecological history in which we live, suggesting liminal moments between light/dark, seen/intuited, day/night, present/future. The project juxtaposes moved-image photographs taken at dusk by Petro with poems written simultaneously by Moreira, created in a series of visits to the Smith College Macleish Field Station in Whately, Massachusetts. The simultaneity of artistic production allows for a deep focus on place, setting, and ecological framing, making the landscape itself a powerful collaborator in the work. The series forms part of Arts Afield, a program at the MacLeish Field Station in which artists and writers visit particular sites—a pool, fern grove, homestead, etc.—over a 200-year period and record impressions. The Arts Afield initiative seeks an increased role for artists and writers at the station, encouraging use of the station's natural and built resources for students, faculty, staff and visitors to create and share artistic work. In particular, Arts Afield will connect to the Long Term Ecological Reflections national program, a consortium of academic field stations that aim to take a 200-year look at ecological changes on field station grounds by encouraging artists and writers to reflect on fixed locations in the landscape. The work will be contributed to a permanent, public online archive seeking to contemplate ecological shifts and threats through lenses other than the strictly scientific. Each poem/photography pairing in Dusk at Macleish contemplates one single Long Term Ecological Reflections site at Macleish Field Station. 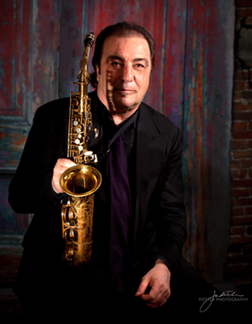 As has become our tradition, every few months we are proud to present new works by members of the Green Street Trio plus Jason Robinson on sax and Don Anderson on trumpet; aka; the Green Street Quintet. This time around we will be adding a trombone to make a sextet. 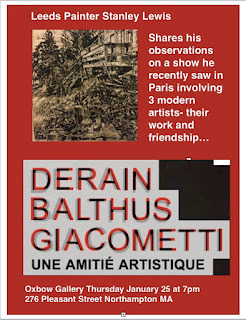 We are ever grateful for your continued support (our wonderful audience) and allowing us this platform to present each week not only wonderful guest artists from around the globe but our own experiments from time to time. We really do consider ourselves blessed for the opportunity. THANKS and hope you can join us for the closest thing we can get to a big band on our stage. Sparks will fly! WHERE: Forbes Library, Reference Room. 20 West Street. Northampton, MA. 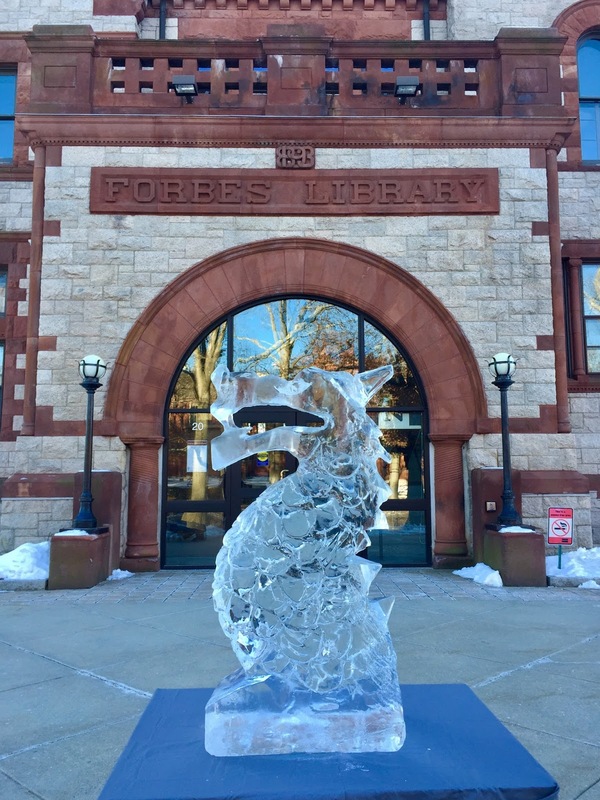 Forbes Library is hosting a Library Legislative Breakfast on Friday, February 2, 2018 at 7:30 AM. This free event is open to the public and is a great opportunity to show support for adequately funding libraries and an opportunity to speak with elected officials. 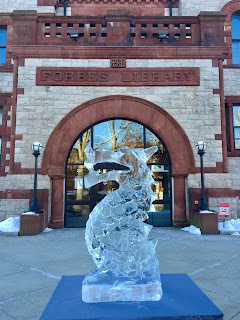 A buffet breakfast begins at 7:30 AM in the beautiful Forbes Library supported by the Western MA Library Advocates and the Friends of Forbes Library. State funded programs are critical to the provision of library services. Citizens of Massachusetts rely on the links between libraries provided through state funding for interlibrary loan delivery, research databases, e-book collections, grant funds, professional development opportunities, and automated networks that provides modern access to and between libraries. State support for public libraries continues to be down. This has placed immense burdens on local library budgets. The members of Rub Wrongways Records, an independent record label from Northampton, are embarking on a musical odyssey in 2018 as the Forbes Library Musicians in Residence. 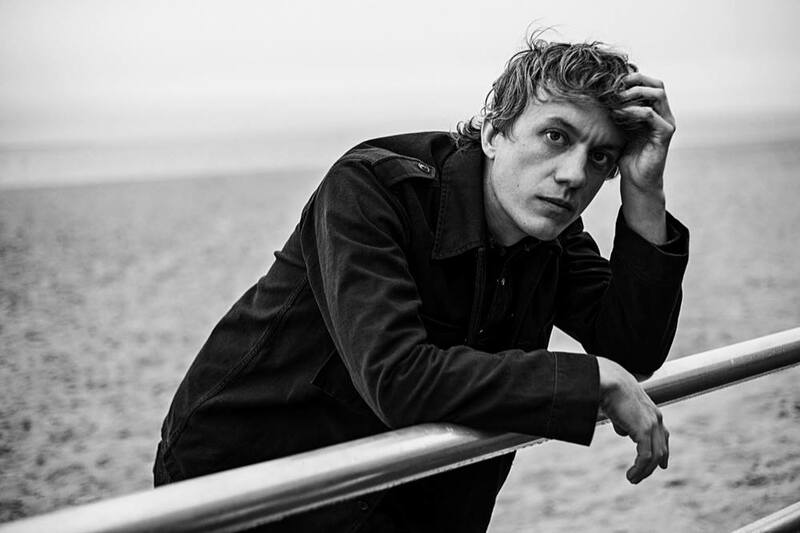 The label’s Jason Mazzotta and Henning Ohlenbusch, two well-known staples of the area’s music scene, will curate a series of performances and workshops. 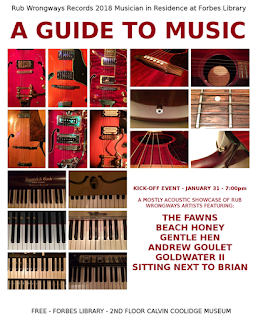 Six events over the course of the year will each feature live music and an informative piece related to the life of an active musician. Learn how to write a song, make a music video, become a rock ‘n’ roll podcaster, and more! The opening event will take place on Wednesday January 31 at 7:00 PM on the second floor of Forbes Library in the Calvin Coolidge Presidential Museum. 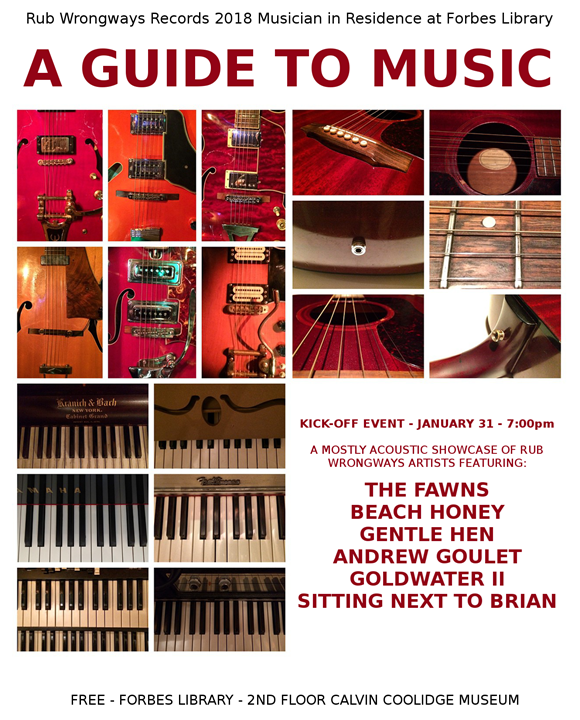 This concert will consist of brief mostly acoustic performances by The Fawns, Beach Honey, Gentle Hen, Andy Goulet, Goldwater II, and Sitting Next To Brian. It is free and open to all ages. Funded by the Friends of Forbes and community donations. Free and appropriate for all ages. $5 PER WORKSHOP. SPACE IS LIMITED. Writers at all levels of experience and comfort with poetry are welcome. In this workshop we'll workshop we’ll cover key poetic terms and devices by studying poems by a handful of modern and contemporary poets. Then we’ll get a chance to try our own hand at writing new poem drafts from a select number of prompts. Throughout the workshop you will have the opportunity to develop your poem drafts and get feedback on your work, moving towards a more polished poem.Through peer critique, you will respond closely to the work of fellow writers in a supportive workshop. Participants can expect to create new pieces on their own and also make new work in collaboration with fellow poets. These workshops are held in memory of Eli Daniel Nemetz Todd, a writer born and raised in Northampton who died in October 2016 at the age of 23. They are made possible by donations to the Northampton Center for the Arts in Eli’s honor. WHEN: Thursday, January 25, 2018 at 7pm. Talk by Stanley Lewis, Thursday, January 25, 2018 at 7pm. 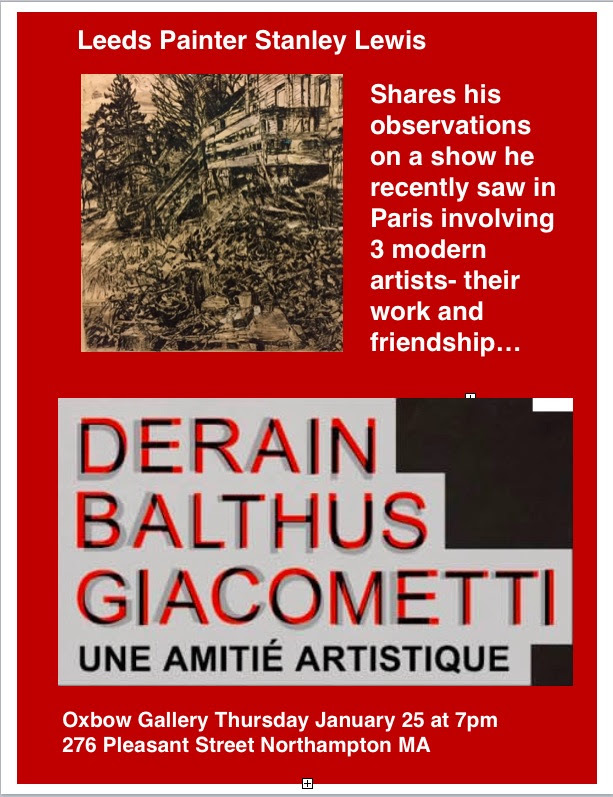 Last fall the Paris Museum of Modern Art mounted a show called “Derain, Balthus, Giacometti: Une Amitié Artistique” which explored the friendship between three major 20th-century artists: André Derain (1880–1954), Balthus (1908–2001) and Alberto Giacometti (1901–1966). 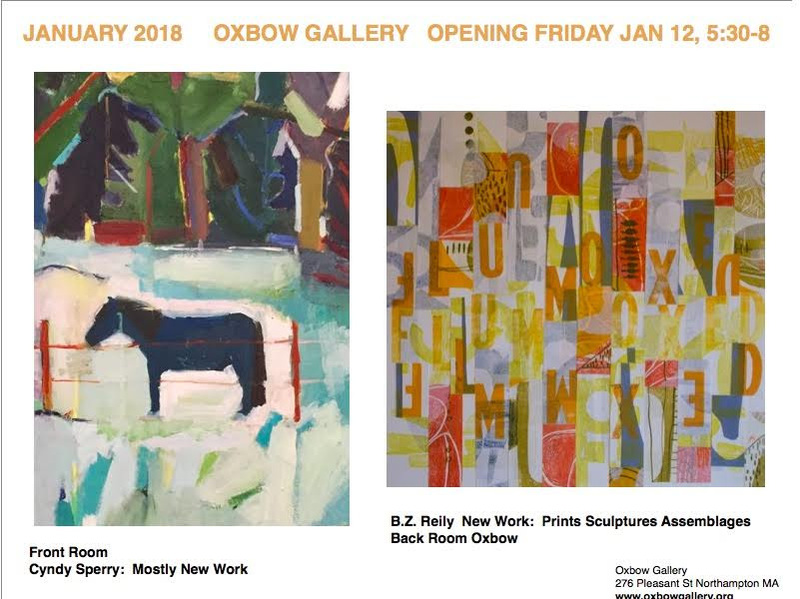 Stanley Lewis, a well-known painter who taught at Smith College during the late 1980s and who was one of the founders of Oxbow Gallery, attended that show in Paris and will give a talk about it on 1/25. Please join us. WHMP presents a live broadcast community forum on the human side of the heroin crisis: “It Won’t Happen to Me.” No doctors, no police or prosecutors, no experts. Just real people who have been affected by opioid addiction. Guests include recovering addicts Deb Wyand and Kali McConnell of Northampton Recovery Center; behavioral resource nurse Khadijah Tuitt; and Henry Brown of Northampton, whose son Patrick died of an overdose in 2016. 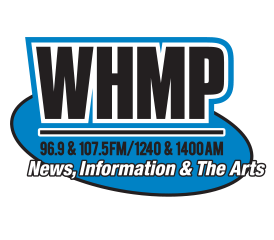 All are invited to attend live as WHMP broadcasts from The Parlor Room, 32 Masonic Street, Northampton from 6-9 p.m. on Wednesday, January 24. Tune in to listen to the live broadcast on WHMP 96.9FM or stream online at WHMP.com. The forum will be rebroadcast Thursday, January 25th, from 7-9 a.m. This live two-hour panel discussion will be moderated by Denise Vozella and Bob Flaherty, who will talk about his son's addiction and ongoing recovery. Everyone is invited to join the parade and follow the oxen down the street. At the end of the parade, warm cider and hot coffee will be served at the Arts Trust building. 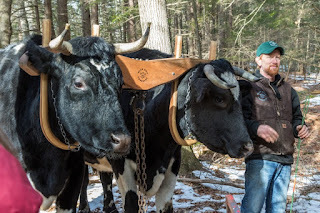 "The oxen move pretty fast," said Jenkins, a descendant of the Clapp family, one of Northampton's early English settlers. "The 'parade' will probably take less than 15 minutes," he said. 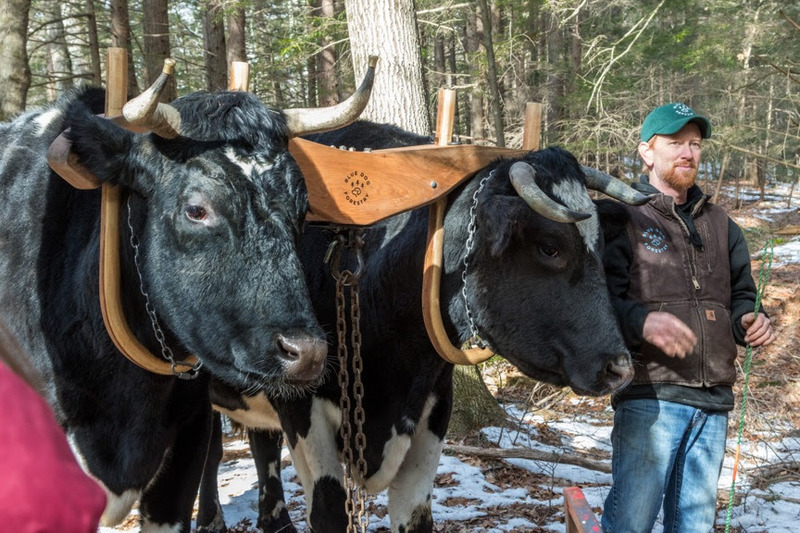 Jenkins works as a private forester and has been logging with oxen for more than a decade. The logs are from two white pine that were taken down earlier this month at Historic Northampton. The trees, which were about 40 years old, were removed in preparation of solar panels being installed on the roof of the museum's Damon Education Center. The program is free and all ages are welcome. Sponsored by: Greenfield Savings Bank, Northeast Solar, Blue Dog Forestry, Woodstar Bakery & Northampton Community Arts Trust. Photo courtesy of the Hilltown Land Trust. The Just Big Enough- Green Housing for ALL architectural design competition will help us highlight how we can create very small very green housing that is affordable to people left out of the green housing market, and find a design solution to some surplus city-owned lots. The competition is sponsored by the City of Northampton, co-sponsored by American Institute of Architects Western Massachusetts, and supported by the Boston Society of Architects Foundation and the Pioneer Valley Habitat for Humanity. All designs will be available at the APE Gallery, Main Street Northampton, from February 6-10th 2018. All prizes will be announced at a reception at the APE Gallery on Friday February 9th at 6:00 PM. Now a winter tradition, the eighth annual Northampton Ice Art Festival begins on Friday, February 9. The public is invited to experience thrills and chills as icy masterpieces take shape at a dozen downtown locations. Work starts early in the day, and completed creations highlight Northampton's "Arts Night Out,” 5pm-8pm. They remain on display through the weekend and beyond if the weather cooperates. In a Festival first, we are adding LED lighting to the sculpture bases, dramatically illuminating them from below. This should make viewing the completed pieces even more exciting during the evening. Featured ice artists come from various backgrounds with diverse levels of expertise. Professional ice carver Joe Almeida has participated in all of the festivals, and this year is no exception as he contributes several themed works at Ode, Inspirit Crystals, and the Eastside Grill. Don Chapelle, founder of Boston’s “Brilliant Ice Sculpture,” also returns to create another classic piece at Thornes Marketplace. Artists David Barclay, Rob Kellner, and Adam Mulcahy make second appearances this year. Also joining the group are veteran ice master Billy Poe, carver Nathan Peterson, and multi-talented Robert Markey Primarily recognized for his snow sculpture prowess, the ever-popular David Rothstein is back, while sculptors Thomas Matsuda and Peter Vacchina make their debuts. See below for a list of ice artists and their sites. Maps will be available online and at many Arts Night Out locations. Additional maps are distributed during the event. The Northampton Ice Art Festival is presented in cooperation with the Downtown Northampton Association and the Northampton Radio Group. It is funded, in part, by a Festival Grant from the Massachusetts Cultural Council. Come help celebrate and support The Shoestring - a new independent web magazine covering culture and politics in Western Mass. This event will include a panel discussion hosted by Ellerie Ballard with our finest writers- Mod Behrens, Ted McCoy, Rojas Oliva, Sarah Jane and Will Meyer. Afterwards enjoy righteous tunage from bands Soft Fangs (CT) and Stoner Will and the Narks. Come see the antidote to the for-profit status quo news cycle and maybe have some fun too. An American institution, still going strong in their 47th season. Quartets by Haydn, Witold Lutosławski, and Ravel. And you’ll be home in time for the Super Bowl! “A national treasure.” (Boston Globe). Sunday, February 4, 2018, 3 p.m. - Spend your Super Bowl Sunday with one of America’s finest and most enduring chamber ensembles, the Manhattan String Quartet! Program TBA. Saturday, March 31, 2018, 8 p.m. - The sleek-sounding Quartetto di Cremona returns to the VCC stage – program TBA. 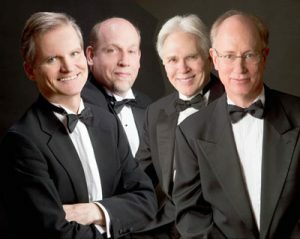 Sunday, May 6, 2018, 3 p.m. - Among the finest quartets of their generation, the Attacca Quartet will play Mendelssohn, Caroline Shaw and Beethoven’s sublime Op. 132. It’s an anomaly to make a record created out of the pleasure and desire of simply making music together. A record with no commercial aspirational location. The new duo record from John Truscinski (drums, synths) and Steve Gunn (guitars), "Bay Head", makes it look easy, carving out a space where none existed before with assurance, resonating beautiful along the way. If I were forced to put what John and Steve play into a genre I would simply call it “music.” There’s a quality of timelessness to it without being nostalgic that is impossible to manufacture. It comes from their years of playing together based on a formula of chemistry. Bands are fragile ecosystems. The best ones have a melding that results in a musicality that otherwise can’t be found in a melody or lyric, or an effect pedal. While "Bay Head" is the third record the duo has recorded together, John has played drums and helped shape the songs and the sound on all Steve’s more song-configured albums. Their bond is tight, unique, and effective. As an instrumental record "Bay Head" has no literal voice. It doesn’t need it, as the constant flow between the drums and guitar describe fully and without a narrator. Steve’s guitar leads you along a contemplative path that describes an inner monologue that is more expressive than if there were words. Some of the guitar parts are worked out and then set free, improvised in the playing. But it’s hard to tell. It all sounds deliberate. "Bay Head" is the accumulation of the duo’s years of playing music together where each can guess where the other is going to go next. The cover collage by their longtime friend Bill Nace reflects what is both abstract and figurative about this unique musical collaboration. As I drink my morning coffee, I use the Gunn-Truscinski Duo's records as a way to make my way into the day. As I am writing, answering email and the like, I find that the spirit of their music matches the gentle light and morning coolness that breeds inspiring thoughts before the LA sun blasts it all away and the day’s minutiae take over. Basically, "Bay Head" is great music to procrastinate to! 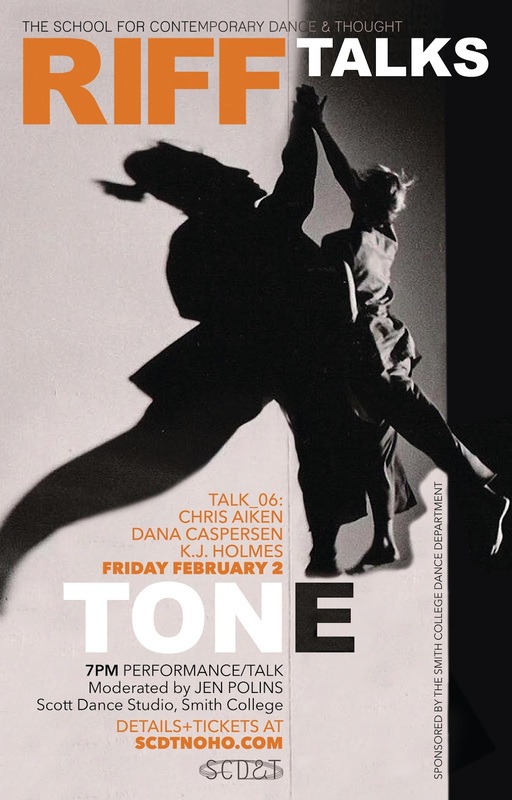 This event is sponsored by SCDT and the Smith College Dance Department. RIFF TALKS is one SCDT's original programs. The School's mission includes an abiding respect for the tradition and history of reinvention, and a resolution to continue challenging established ideals. SCDT serves as a hub for performance art of the highest quality by connecting communities on an international scale. The School showcases contemporary movement training and performance practices that embrace multiplicity, arouse curiosity, and emphasize personal choice. ﻿SCDT is comprised of independent and internationally experienced performance artists/movement practitioners who are also innovative teachers. The School offers adult and youth programming in dance training that includes modern, ballet, hip hop, contemporary Indian dance, and improvisational techniques. WHERE: 13 Queen - 13 King Street Northampton, MA. WHEN: The City Sports Grille at Spare Time Northampton, 525 Pleasant St, Northampton. WHAT: New Repertory Theatre’s production of "Thurgood"
The Academy of Music Theatre will present the New Repertory Theatre’s production of Thurgood on Friday, February 16 at 7:00pm. 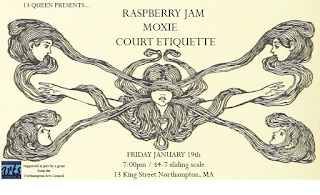 The performance will be held at the Hampshire Council-Gov Courthouse in Northampton. 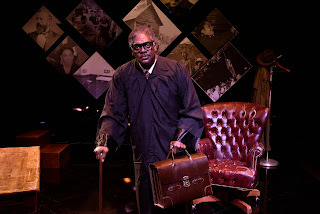 Audience members will sit in the courthouse viewing seats as actor Johnny Lee Davenport portrays the role of Thurgood Marshall in one of the “greatest performances of the year” (Boston Post-Gazette). Written by the 17-time Emmy-winning playwright George Stevens, Jr., directed by Benny Sato Ambush and featuring actor Johnny Lee Davenport, Thurgood spans Justice Thurgood Marshall’s impressive career as a lawyer, arguing such landmark cases as Brown v. Board of Education, and is a remarkable tribute to Marshall’s enduring legacy as the first African-American to sit on the Supreme Court. Johnny Lee Davenport (Thurgood Marshall) won the Elliot Norton Award for “Best Actor” in Broke-ology with Lyric Stage Company in 2011 and named “Best Actor” by Boston Magazine. Mr. Davenport has played more than 50 roles in 24 of Shakespeare’s plays including Richard III (Commonwealth Shakespeare Company); Pericles (Actors’ Shakespeare Project); and Richard II (Shakespeare & Company). Thurgood will run for one night only on Friday, February 16, 2017 at 7:00pm. Adult Tickets are $20 (plus applicable fees). 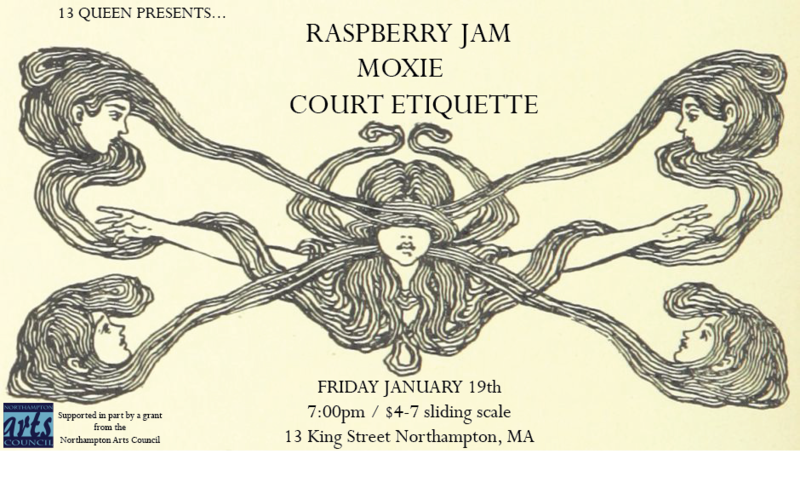 The event will be performed at the Hampshire Council-Gov Courthouse in Northampton at 99 Main St., Northampton, MA 01060. Northampton Community Television Launches 5th Year of Grants for Short Films, Classes, Community Art, and Virtual Reality. As an extension of its mission to support and resource expression of all kinds across media in the greater Northampton community NCTV is again giving out money to support the time and effort for creators to craft content. This represents the 5th year of such grants, which have empowered projects throughout the community. Grants are open to the public at northamptontv.org/grants and applications are due on February 16, 2018. The grants cover a broad range of multimedia related projects, including short films, classes, community art projects, and virtual reality and are available for up to $2000. The grants recognize that among the resources people need in order to be empowered to create are included time and security. Mass Cultural Council promotes excellence, education, diversity, and inclusion in the arts, humanities, and sciences to foster a rich cultural life for Massachusetts through a wide range of grants, initiatives, and advocacy. We work with partners in government, the cultural community, and across sectors, to increase public and private investment in the arts, humanities, and sciences. Mass Cultural Council, the state’s arts agency, is seeking an individual for the position of Program Officer in its Community Initiative. This position is an integral part of the Mass Cultural Council’s Community team in all of its work. The Mass Cultural Council is looking for a person with significant experience in the field of grantmaking, or a municipal environment, or a cultural organization. Initially, the Program Officer will report to the Program Manager of the Cultural Districts Initiative (part of the Community Initiative) and serve as the primary contact for Cultural District in the following 12 regions: North-Central Massachusetts, Martha's Vineyard, Greater Boston, Nantucket Island, Plymouth County, Greater Springfield, Cape Cod, Franklin County, Greater Merrimack Valley, Hampshire County, Metro West, and Southeastern Mass/Bristol County. Over time, the workload will change and a flexible attitude is crucial. Respond to inquiries from applicants, municipal officials, and constituents. Work to support smooth administration of the Cultural District Initiative on the local level. Promote a regional approach to support the Community Initiative. Work collaboratively with the Local Cultural Council and Festivals Program staff in assigned regions. 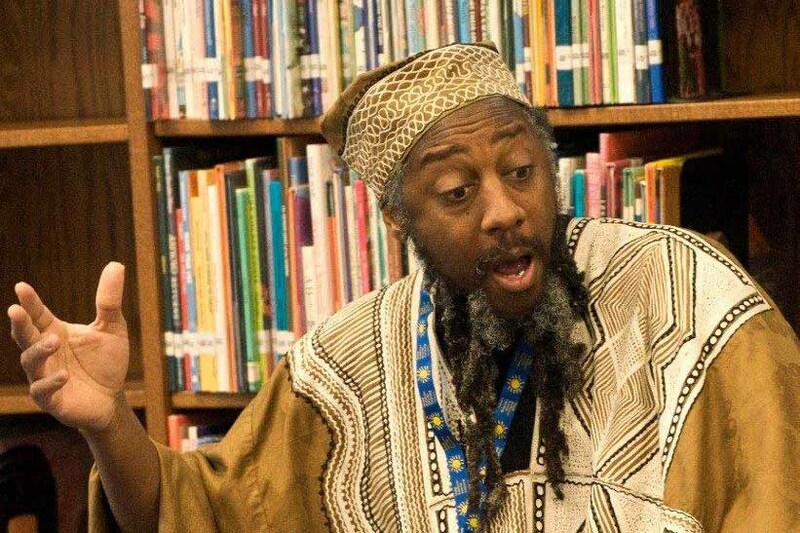 On Tuesday the 16th we welcome vocalist and story teller Eshu Bumpus along with saxophonist Jason Robinson. We will be honoring the memory of Dr. Martin Luther King Jr. by playing songs related to the struggle for equality and freedom; specifically songs that came from the jazz artists of that time who were deeply moved by the struggle. Eshu, besides being a great story teller, specializing in African folk tales is also a gifted singer who's musical heart is rooted in jazz. 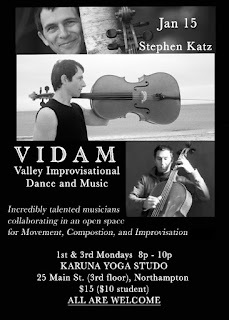 We will be doing songs by Charles Mingus, Billy Taylor, Les McCann, Miles Davis and others. 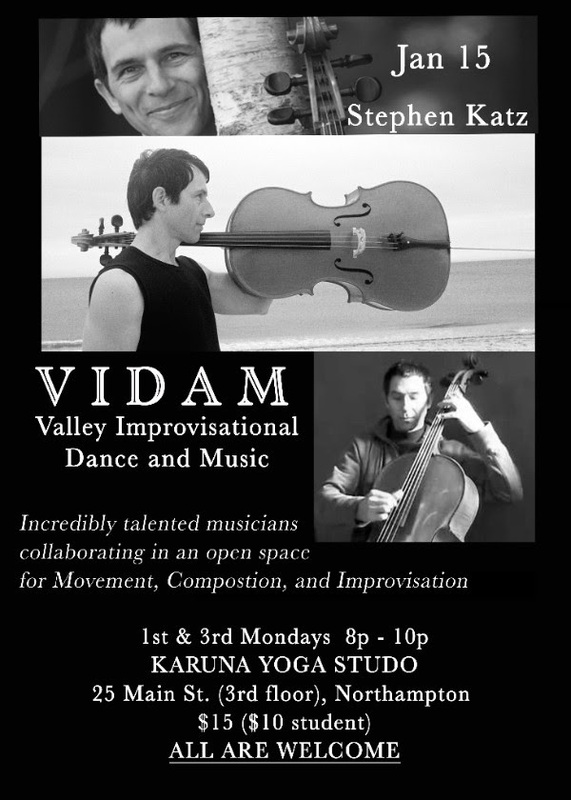 Join our VIDAM Facebook Group! The Performance Project is a venue for self-representation in a culture where politics, social structures and the media suppress expressions of truth and the depth of economic oppression, racism and incarceration in our country. Our creative work is informed and shaped by the experiences and beliefs of ensemble members, who claim full authorship for the plays they produce. Through the performances, audiences have had the opportunity listen to the experiences and ideas of people whose stories are rarely told, and to expand their perspective and expectations of people coming out of jail. 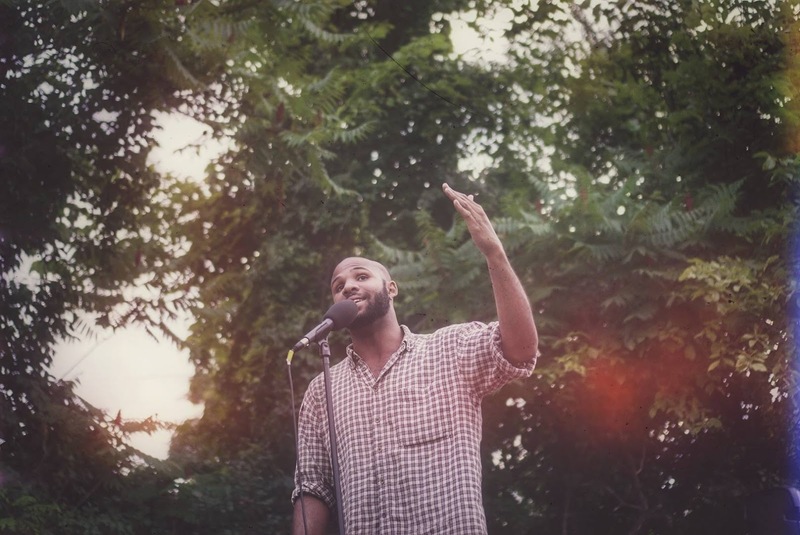 The plays address critical social and cultural issues, and initiate a dialogue between people who have been incarcerated and their communities. The Lyra Music Festival is an outstanding series of summer classical music events bringing together world class musicians, outstanding young string players and pianists and an exceptional faculty of professional musicians and educators for concerts, masterclasses and outreach performances. Join us in Northampton, MA in July for this exciting summer festival! Season Passes and Individual Event Tickets are for sale Here. Internationally recognized musicians join Lyra Music on the solo concert stage each summer. Guest Artists have included musicians such as Simone Dinnerstein, Frederic Chiu, Matthew Zalkind, Itamar Zorman, Sibbi Bernhardsson, Michael Brown, Dane Johansen, Spencer Myer, Alexi Kenney, and Melissa White. These world class musicians perform in festivals and with ensembles including: Marlboro Music Festival, Ravinia Festival, Aspen Music Festival, Escher Quartet, Pacifica Quartet, Harlem Quartet, Chamber Music Society of Lincoln Center, Cleveland Orchestra and the New York Philharmonic. 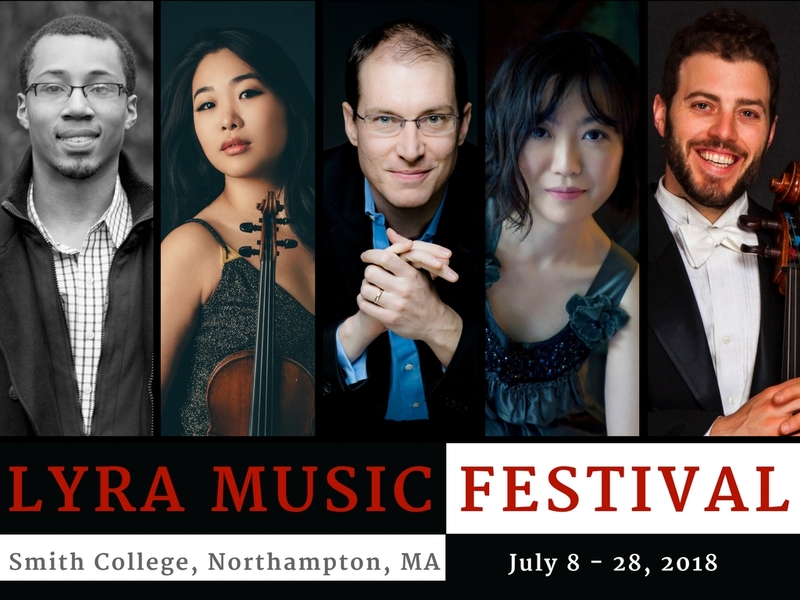 Lyra Festival audiences also have the option to go behind-the-scenes, attending Masterclasses where they will hear Lyra Music Workshop advanced students perform and watch as these students receive one-on-one coaching with Lyra Music Guest Artists. Learn more about the musical process and these incredible guest musicians as they share their personal insights and inspiration with Lyra Workshop students and the public. The Lyra Festival brings music to the community! Lyra Music’s exceptional students perform free outreach concerts, sharing live classical music with audiences and organizations in the surrounding community. Lyra Students perform at nursing homes, senior centers and even enjoy a collaboration with the Eric Carle Museum and Stamell Stringed Instruments performing for the youngest audiences. 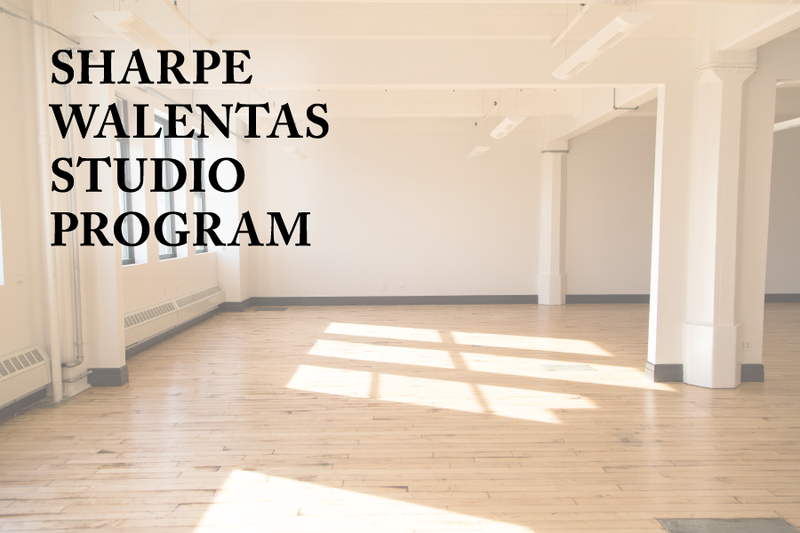 Apply now for the Sharpe-Walentas Studio Program's 2018-2019 residency! The Sharpe-Walentas Studio Program awards rent-free non-living studio space to 17 visual artists for year-long residencies. Its mission is to provide working studio space and community for artists. Artists are selected annually based on merit from a competitive pool of applicants by a professional jury comprised of artists and members of the SWSP Artists Advisory Committee. The Sharpe-Walentas studios are located amidst a thriving waterfront community full of art galleries, creative professionals, and independent retailers. Studios have freight and passenger elevator access, high ceilings and natural light. Communal spaces include a kitchen, slop sinks, restrooms and a sitting area with wi-fi. Studio access is 24 hours/7 days week. The Sharpe-Walentas Studio Program is the new face of the Marie Walsh Sharpe Art Foundation Space Program, developed for artists, by artists in 1991. 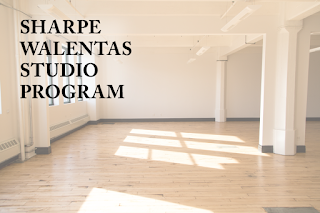 In 2014 the program was renamed the Sharpe-Walentas Studio Program to honor the legacy of Marie Walsh Sharpe and reflect the new sponsorship and commitment of the Walentas Family Foundation. 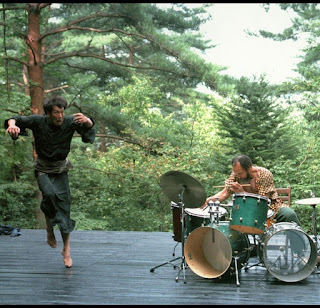 MILFORD GRAVES FULL MANTIS is the first ever feature-length portrait of renowned percussionist Milford Graves, exploring his kaleidoscopic creativity and relentless curiosity.Graves has performed internationally since 1964, both as a soloist and in ensembles with such legends as Albert Ayler, Giuseppi Logan and Sonny Sharrock. He is a founding pioneer of avant-garde jazz, and he remains one of the most influential living figures in the evolution of the form. The film draws the viewer through the artist’s lush garden and ornate home, into the martial arts dojo in his backyard and the laboratory in his basement - all of this just blocks from where he grew up in the housing projects of South Jamaica, Queens.Graves tells stories of discovery, struggle and survival, ruminates on the essence of 'swing,' activates electronic stethoscopes in his basement lab to process the sound of his heart, and travels to Japan where he performs at a school for children with autism, igniting the student body into an ecstatic display of spontaneous collective energy. Milford Graves Full Mantis, was selected to have its world premiere in late January 2018 at IFFR International Film Festival Rotterdam, as part of the Perspectives section, a program focusing on Pan Africanism in African Cinema. MGFM is a primary document - the film features never before seen material from Milford's archive, performance footage spanning five decades, unreleased electronic music by Graves, unreleased footage of his first tour in Japan with Butoh legend Min Tanaka, combined with an exclusive and unprecedented look into the brilliant mind of a living master. Artists, Cultural Organizations, & Creative Businesses - join us at the Spring Arts and Humanities Internship Fair! Are you an artist, cultural organization, or creative business interested in having a student intern for the spring or summer? 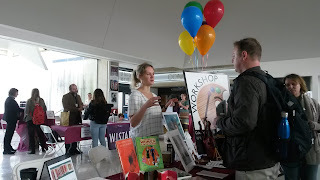 Then we invite you to join us for the Arts Entrepreneurship Initiative’s Spring Arts and Humanities Internship Fair on Tuesday, February 13 from 11:00 AM – 2:30 PM at the Fine Arts Center Atrium! The fair will be an opportunity for you to meet prospective interns in our arts (studio arts, art history, history, theatre, music & dance), humanities, and arts management programs. Internship postings for the fair need to be submitted by Wednesday, February 7 - space is limited so early application is highly recommended. See Internship FAQ for more information. The first half-hour of the internship fair will be an opportunity for you to setup and network with other area artists and arts organizations. We will have refreshments just for internship providers and time for you to meet and talk. 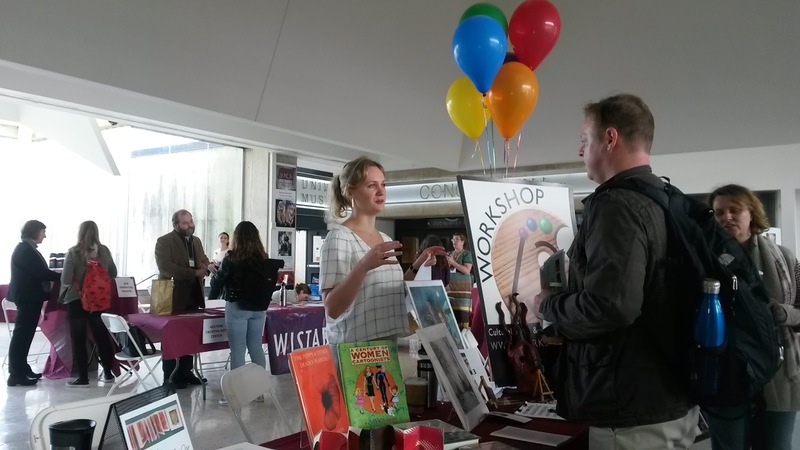 The opportunity to network with fellow artists and arts organizations was one of the top highlights articulated in our follow-up surveys from prior successful internship fairs! Students will begin arriving at 11:30 AM. Participation in the Internship Fair is free, but space is limited. If you are interested in participating, please read the AES Internship FAQ page and fill out the AES Internship Posting Form (one for each internship opportunity) found at the Internship FAQ page and email the form(s) to aes@acad.umass.edu by Wednesday, February 7. On View: January 11 - February 4, 2018. The Northampton Arts Council is pleased to announce the awarding of 34 grants totaling $18,000 in support of a variety of projects from funds raised through event-programing within the Northampton community. Our signature events include the Silver Chord Bowl, Summer Concert Series in Downtown Northampton/Paradise City Cultural District, Transperformance, RETROFaire, and First Night Northampton. The funding of these projects would not have been made possible without our community members who continue to show up in support of our benefit events and the sponsors and donors who contribute time and again. Each year we are in awe of the outstanding applications we have the honor of reviewing, and unfortunately, this year we were unable to fund many worthy projects. The Arts Council received 60 requests for almost $98,500 of funding. This year grants were awarded in the following categories: Film/Video, Dance, Literature, Mixed Media, Music, Theater and Visual Arts. The Northampton Arts Council is pleased to announce the awarding of 23 grants totaling $11,950 in support of a variety of projects from funds allocated by the Massachusetts Cultural Councils' LCC program. The caliber of applications this round was outstanding, and we were unable to fund many worthy projects. The Arts Council received 40 requests for almost $35,750 of funding. Grants are awarded in the following categories: Dance, Film/Video, Literature, Mixed Media, Music, Theater and Visual Arts.